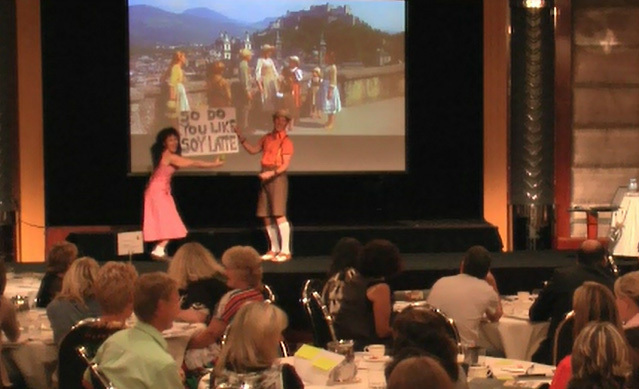 David recently created a fun 'Sound of Music' parody for a teachers PD day for the Department of Education and Early Childhood Development. An annual Professional Development leadership program run by the department for selected teachers to learn advanced teaching skills. To stand out amongst an otherwise academic-style seminar. It was agreed to perform a parody of the "Do-Re-Me" scene from the movie "The Sound of Music". David played the older boy, Freidrich, and his colleague Natalie Krasnostein played the youngest girl, Gretl. The characters were portrayed as the adult versions of the children, and now working as teachers in Victoria. They came out of the audience spontanously during one of the 'Q&A' periods. The main performance was 12 minutes of musical theatre placed before lunch, performed in front of a screen playing the scene from the movie. It began with banter in the audience, as if Freidrich and Gretl had coincidently re-united in that moment. On stage they made comments to the video, sung along with new words and danced - all reinforcing the content of the seminar. David had a clear concept of the task; creative with words to fit the theme, rhyme and align to tune chosen; ability to adapt or change direction as needed; passionate about getting it right; extrovert; comical. At the end of the day they reappeared to perform a shorter 5 min finale rendition - using a medley of songs from the movie with the words changed to suit the seminar. This was a fun piece that reinforced the earlier session and finished the day on a high for participants. Feedback from the participating teachers was very positive, many appreciating that they could have a good laugh and were totally surprised by the unexpected nature of the performance. David provided a good mix of taking some guidance and working up several ideas and options. He has a great attitude to working things through and taking feedback. His process of checking that he was on the right track and then presenting his ideas and thinking for constructive criticism worked very well and ensured we got a presentation that met our needs and that we were very happy with. He is highly professional – arrived early, ran on time and operated flexibly throughout the project; and very competent and polished as a presenter. DEECD had the initial idea of using the Sound of Music theme. David and Natalie then developed the script and choreography in consultation with the Department. David was very receptive to the direction staff at DEECD provided in the rehearsals and other preparation prior to his performance. David took this direction on board whilst providing carefully considered contributions of his own that then influenced and enhanced the final performance piece. He worked the crowd well with movement, words and song and provided cleverly timed delivery with a comedic touch. .- Fiona Roberts, Program Manager, Teacher Professional Leave, DEECD. 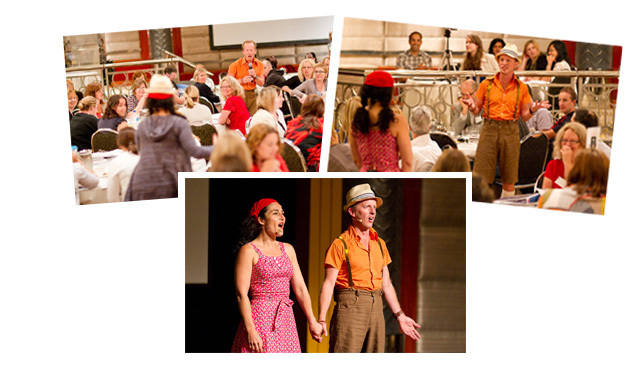 Would you like to see some of this at your next event?